Description: Sexes similar. 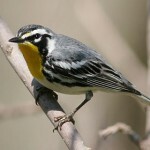 Olive green above; paler below; yellow undertail coverts; faint streaking on sides of breast; slightly downcurved bill; faint whitish eyebrow; and orange crown feathers, which usually remain hidden. No eye-ring or wing bars. 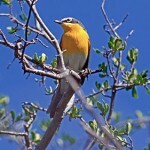 Habitat: Deciduous forests, woodlands, and brushy thickets. Also forage in stands of tall sunflowers, ragweeds, and shrubs, often fairly close to the ground. 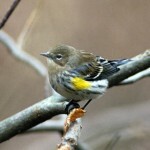 Field Notes: Orange-crowned Warblers only display their crown during courtship or when alarmed. 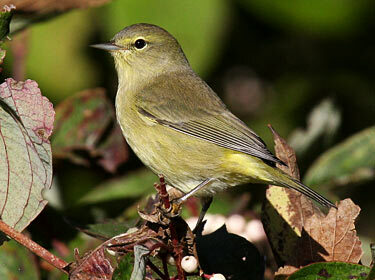 Fun Facts: The Orange-crowned Warbler is divided into four sub-species that vary in plummage, size, color, and molt patterns.